Lumascape d5 series LED drivers offer exceptional control and protection for the LEDs they power, and form a core part of Lumascape LED engineering philosophy. At the heart of this philosophy are the concepts of simplicity and durability: Ease of installation and connection, and a long, trouble-free life. The d5 LED driver goes beyond simplicity and durability to also deliver exceptional control and LED protection features. Being so compact, the d5 driver fits inside any luminaire. 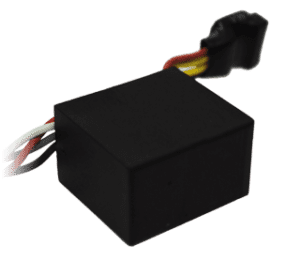 It provides protection to the LEDs by sensing operating temperatures on the LED board and in the driver itself, shutting down the power to the LEDs if a high temperature condition is detected, and auto-restarting when it is safe to do so. The d5 driver series also has the ability to dim via analog (0-10 V) and digital signals (PWM). The brightness of a luminaire containing a d5 driver can also be set without any external controls. The brightness can be set in 10% increments simply by switching the luminaire on/off in a pre-defined pattern. There is no need to open the luminaire or set DIP switches. All luminaires containing a d5 driver on the same circuit can be programmed at once. Alternatively, the factory can pre-program the brightness. For complete instructions on how to set the brightness in the field, click here. Regardless of the method, the LEDs are dimmed on a 14-bit PWM resolution, providing exceptional control and the capability to dim to 2% with no color shift or flicker.